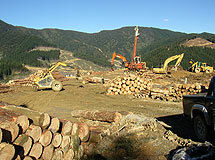 The Marlborough Forest Industry Association (MFIA) is an incorporated society representing the collective interests of forest growers, sawmillers, contractor service suppliers and forestry related businesses in Marlborough. Marlborough is situated in the north of New Zealand's South Island where it enjoys a temperate climate allowing for a diversified economy encompassing forestry, viticulture, aquaculture, farming, horticulture and tourism. Foresters in Marlborough own 71,400 hectares of plantation forest which represents 4% of New Zealand's plantation forest resource. The main species is radiata pine making up 95% of the forest area. The region has a progressive infrastructure with a deep-water export port at Shakespeare Bay near Picton and two medium-sized sawmills. This is a report by the Marlborough Forest Industry Association (MFIA) aiming to summarise the economic contribution of the Marlborough forest growing and processing industries (the forest industry) to the Marlborough regional economy.